The WNF-342 was the work of three engineers - Friedrich von Doblhoff, A.Stepan and Theodor Laufer - at the Wiener Neustadter Flugzeugwerke in Vienna. The operating principle was to use a conventional piston engine driving a compressor to provide a compressed air supply, which, after mixing with fuel, was fed as a combustible mixture up through the rotor hub and out through the three hollow rotor blades to be burnt in tip-mounted combustion chambers, thereby generating thrust. 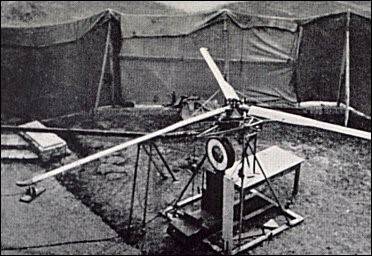 Doblhoff first built, in 1942, a ground test rig to prove the principle of his proposed rotor drive system, consisting basically of a trio of hollow rotor blades mounted on a scaffold with the fuel/air mixture fed through each blade to a small jet unit at the tip. A compressed air tube entered the rotor hub, and vaporized petrol was added by special tubing. The mixture was ignited at the blade tip by an automobile sparking plug. The demonstration proved so successful that the rotor actually 'took off' from its moorings, lifting about a yard into the air an anvil that had been attached to it to hold it down. Encouraged by this success, Doblhoff and his team then applied the principle in the small single-seat WNF-342V1 which he hoped would meet a German Navy requirement for an observation helicopter to be carried by submarines or small naval vessels. This first prototype, powered by a 60hp Walter Mikron II engine, was flown in spring 1943. 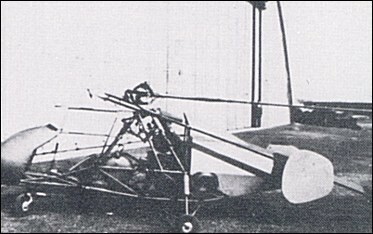 The airframe, constructed from welded steel tube and fabric covered, had a gross weight of 360kg, twin tail fins and a tricycle undercarriage. 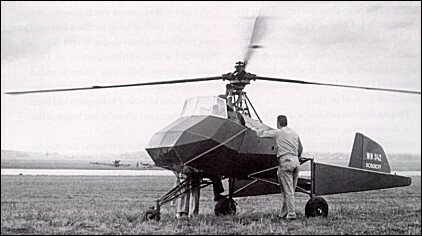 The rotor was fitted with flapping and drag hinges. Flight testing revealed the need for rather more side area, but performance was otherwise satisfactory, and when the WNF factory was superficially damaged during an Allied air attack in mid-August 1943 the aircraft was moved to a safer site west of Vienna, at Obergraffendorf. Here a second machine, the WNF-342 V2, was built, being a somewhat heavier aircraft at 460kg gross weight, despite its open-framework fuselage. The main difference lay in the sail-like tail unit, this comprising a large single rectangular fin and an elongated rudder pivoting about a horizontal axis. The 60hp Walter Mikron engine was replaced by a 90hp Walter Mikron engine. A conventional piston engine drove a compressor, in this particular case the supercharger blower of an Argus 411 engine. The mass flow of compressed air produced by this blower was mixed with fuel before passing through the hollow rotor blades to chrome steel combustion chambers situated at the blade tips. Combustion of this fuel-air mixture occurred at a rate of approximately 280 times per second. Starting with the V3 machine, increases were made in rotor diameter, and both the V3 and V4 used the extra power of the 140hp BMW Bramo Sh 14A engine to drive the compressor. In all designs, an Argus As 411 supercharger was adapted as a compressor. Before the end of the war, consideration was being given to replacing the compressor system with rotor mounted pulse-jets or even miniature turbo-jets. Within their limited performance, the V1 and V2 machines flew smoothly enough, but serious vibration manifested itself in the V3 machine and ground resonance vibration eventually destroyed it. Each of the first three machines (V1, V2, and V3) was provided with only a small rear propeller to blow air at the tail surfaces for steering. For the first three machines, although flapping and dragging rotor hinges were provided, no blade pitch-change arrangement was made since this was not required for early tests, vertical control being provided simply by varying the rotor speed. Experience with the first two machines showed that the high fuel consumption of the tip-jets would make the WNF-342's operating costs prohibitive, and so a major design change was introduced in the V3 and V4 prototypes. The tip-drive system was retained for take-off, hovering and landing only, a selective clutch enabling the engine (now a 140hp Siemens-Halske Sh.14A radial) to drive a conventional pusher propeller for forward flight while the rotor blades 'free-wheeled' in autorotative pitch. To clear this propeller the rotor pylon was raised above the cabin and the tail unit was redesigned as a twin-boom assembly, that of the V3 carrying two end-plate oval fins and rudders while that of the V4 had a single fin and rudder mounted on the tailplane centre. Gross weight of the V3, a single-seater with 9.88m diameter rotors, was 548kg. By the time the WNF 342 V4 was built a control method had been devised to provide both collective and cyclic pitch control. Each rotor blade was connected to the rotor head by means of a flexibly coupled tube flanked by steel-strip leaf-type spring straps connected to an upper aluminium alloy casting. This upper casting rotated in a lower fixed casting, a seal being provided between the two, and fuel mixture flowed into this hollow assembly to be piped out to each blade. Passing up through the casting was a hollow fixed shaft which carried a bearing for the upper casting and which was flexibly connected to the helicopter framework. Inside this hollow shaft, a solid shaft rotated in a spherically seated bearing to carry the blade pitch control spider at its head. Thus, angular displacement of this solid shaft tilted the spider to give appropriate cyclic pitch control. For collective pitch control, the spider was connected to the solid shaft by means of a pressure regulator connected to the upper casting (containing the pressurized fuel mixture) by a pipeline. The spider was given a vertical movement according to the mixture pressure opposed by springs within the regulator. In addition, collective pitch was governed by the torsional stiffness of the centrifugally-loaded spring straps. When the pilot moved the throttle control, a rapid increase (for example) of mixture pressure and jet thrust followed by an increase in collective pitch ensued, while the rotor rpm remained constant. 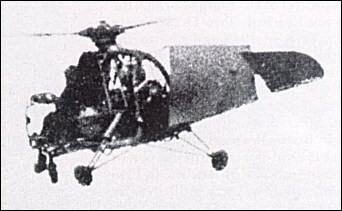 The V4 had a second propeller mounted co-axially to provide thrust for forward flight when clutched to the compressor motor. 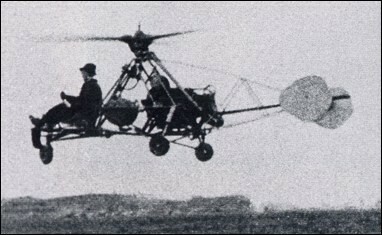 Thus, by gradual development, the rotor jets (which had a high fuel consumption) were only used for take-off, hovering and landing, and the rotor blades turned by autorotation for forward flight in the manner of an autogyro. The V4 had side-by-side open cockpits for a crew of two. The V4 was hovered for a total of 25 hours, it was not tested in forward flight above 40 to 48km/h before the programme had to be halted. In April 1945, Soviet troops approaching Vienna caused Doblhoff’s team to withdraw hastily to Zell am See where the V2 and V4 machines were captured by United States' forces. Doblhoff later accompanying it back to the United States to assist with further tests before joining McDonnell to work on development of the XV-1. Stepan, who had done most of the test flying on the WNF-342, joined Fairey in the United Kingdom after the war, while Laufer went to work for the SNCA du Sud-Ouest in France where he worked on the jet-propelled Djinn. On September 9, 1946, the General Electric Company (specifically, the Thermal Power Systems Division of its General Engineering and Consulting Laboratory) was permitted by the USAAF to evaluate the WNF 342 V4 in connection with that company’s work on the power plant of the XR-17 helicopter, which would later become the Hughes XH-17. It was shipped by a Fairchild C-82 to Schenectady, New York on December 6, 1946, where it was tested and studied by General Electric under Army Air Force Contract No. W-33-038-AC-16283. This article presents their evaluation report dating from April 30, 1948. Igor Bensen, one of the primary authors of the report, would go on to perform many test flights of the WNF 342. Unfortunately, he suffered severe spinal injuries when the helicopter was destroyed in a ground resonance accident; these injuries would plague him throughout his life. However, they did not stop him from playing a significant role in the development of the Hughes XH-17 and eventually founding his own company, Bensen Aircraft, which produced a successful line of gyrogliders and autogyros over the course of several decades. Doblhoff was also involved with the XH-17 program, as well as the McDonnell XV-1 convertiplane, among others. The WNF 342 V4 has been preserved by the Smithsonian Institution, Washington.